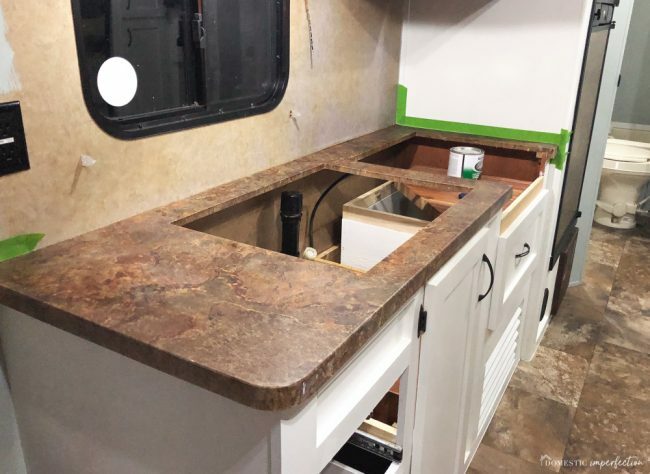 Adam and I considered lots of different things for the laminate countertops in the RV (we were this close to skimming it with concrete). It’s a tiny amount of surface space, so we could pretty much do anything without it being expensive. In the end we decided just to paint them, since neither of us wanted to put in the time or effort to rip out and replace the counters (or risk the concrete layer cracking and flaking off). 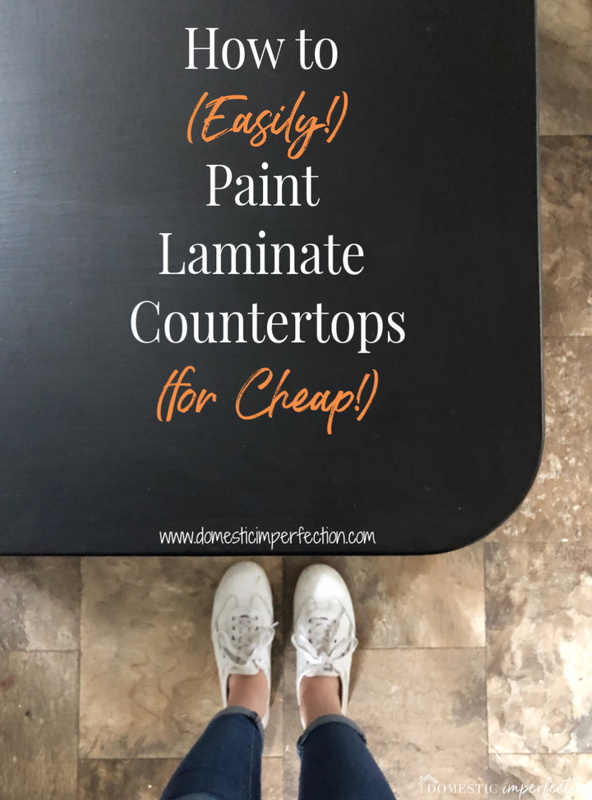 There are a ton of kits and products out there for painting countertops, but I decided to keep it simple and just use chalkboard paint. It’s cheap, easy, appears to hold up pretty well…what’s not to love? So let’s get right into the tutorial! If you owned none of these products before starting, it would still only cost approximately $20 -$25 to do this project, even on a huge surface. 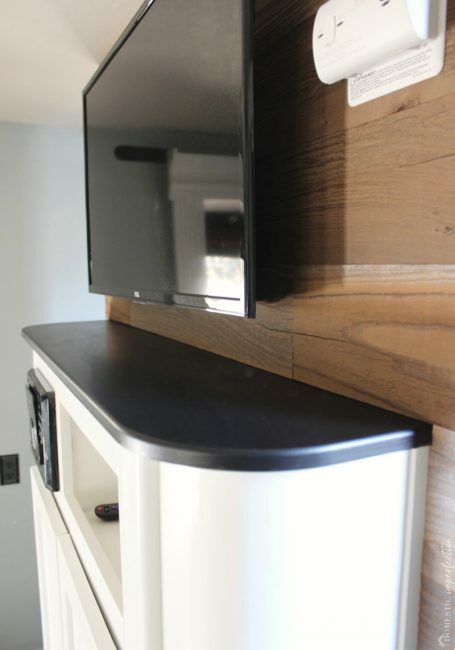 Sand the countertop so that the paint adheres better to the surface. I used 220 grit, but it doesn’t matter. Use what you have. After you sand, clean the surface and allow dry completely. 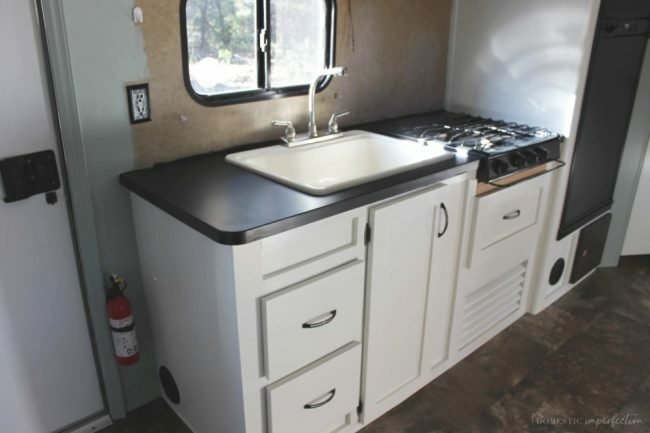 Remove the sink, stove and whatever else is going to be in the way. Also tape off the areas where you don’t want paint, like the backsplash (which we haven’t installed yet). Prime the countertop. I didn’t do this, I just went straight into painting. Swim at your own risk. 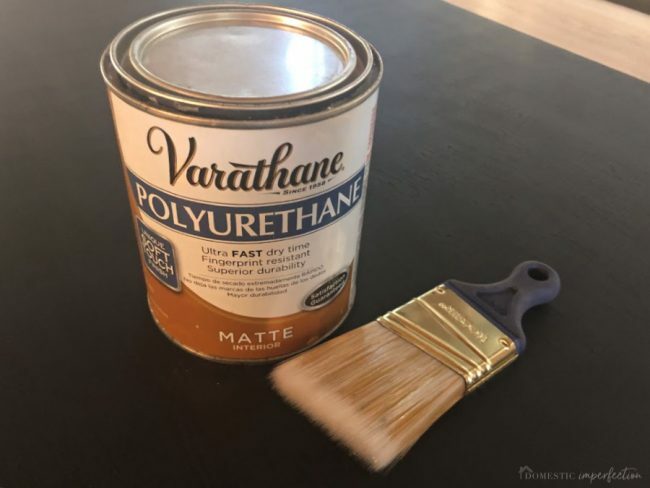 If you choose to prime I would recommend an oil based primer, like this one. 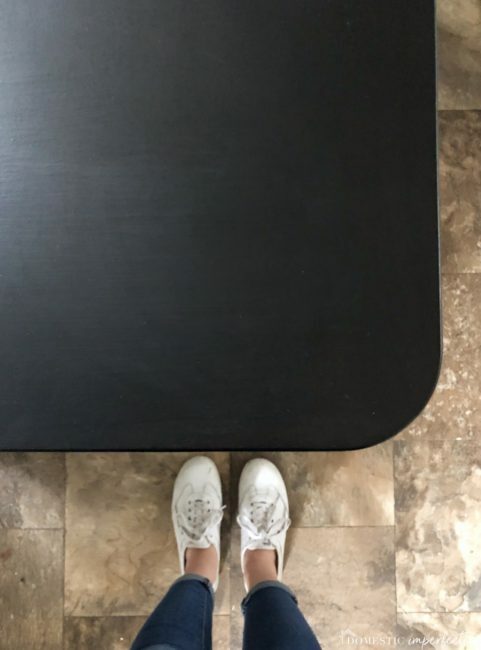 Paint the countertop. On a large surface using a small roller would be ideal, but my surface was tiny and had lots of cutouts, so I just used a paintbrush (this one is my absolute favorite and the only one I use, and you can buy them in bulk on Amazon for a great price.) I did three coats, with about an hour dry time between each one. 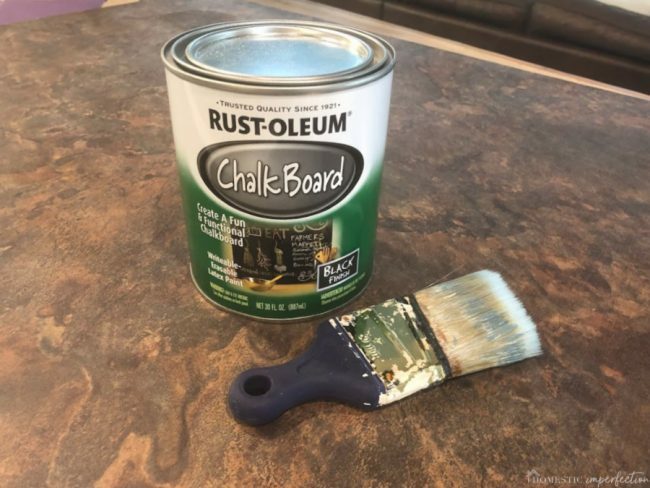 The chalkboard paint will feel dry to the touch after about 30 minutes, but the can says to wait 24 hours before putting on a second or third coat. Obviously, I’m not great about following directions, but so far it hasn’t really mattered. Lightly sand the dry countertop and wipe clean. Use the highest grit sandpaper you have for this, otherwise you will sand off all the paint and hate life. You just want to remove any brushstrokes or in my case, dust and dirt that dried into your paint. 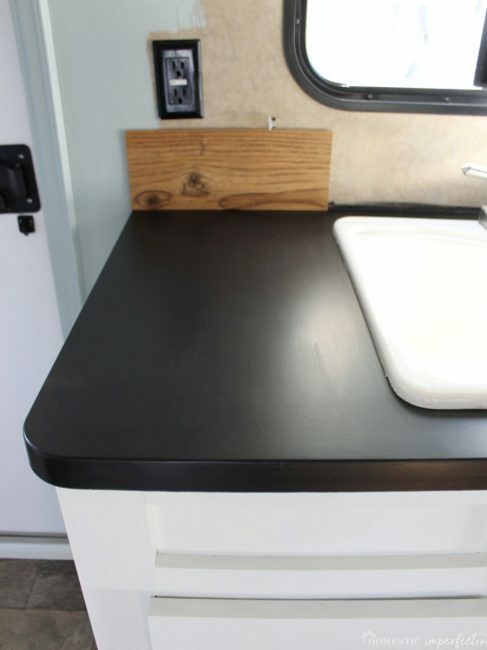 Side note – I painted the table in the RV first to make sure this method worked before doing all the countertops. I tried to give that one some texture and variation to make it feel more like soapstone. Here is what it looked like after a light sanding. I was kinda digging it. Then I sealed it and you can’t really any of the texture. Oh well. The good news is that if your paint job isn’t perfectly smooth, it won’t really matter in the end. After the paint is fully cured (I waited a day) add your sealer. If you don’t use a sealer you will be able to use it as a chalkboard, but that obviously wasn’t my intent. 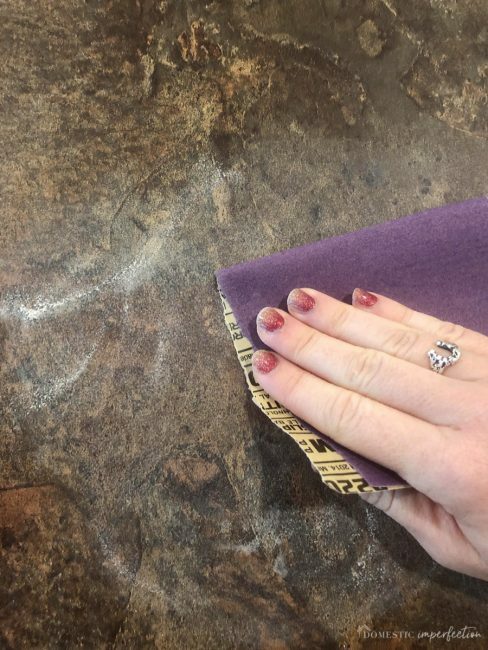 I wanted a very, very matte look, so that the countertop would look like soapstone. 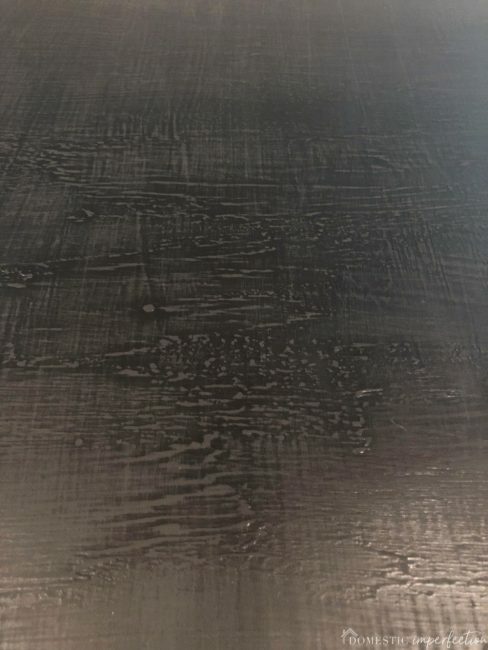 Putting a wax finish on it would be ideal for this, but wax isn’t hardy enough for a kitchen countertop, no matter how irregularly it is used. 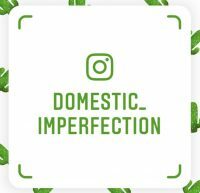 Instead I used my go-to matte sealer, which is this one. I brushed on two coats and called it a day. Easy. 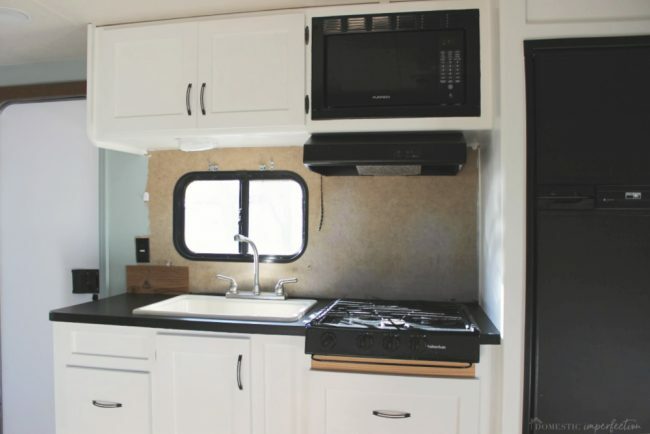 The final step is to reinstall the sink and appliances, and then caulk around the edges. 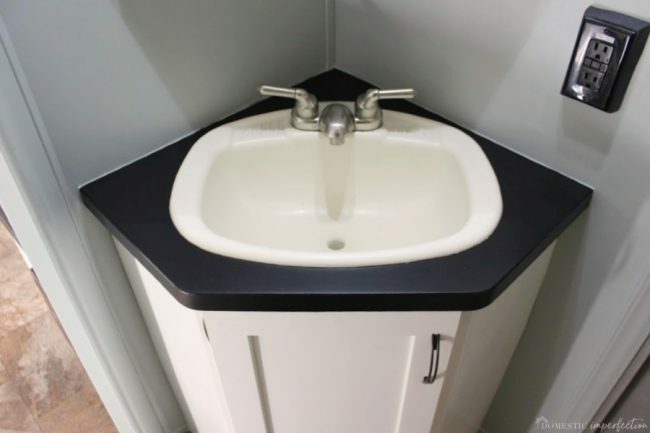 You can buy black caulk at the hardware store to match the countertop, or you can go with clear or white or whatever you think will look best. I actually just realized that I haven’t caulked my sink into place yet, but I will. So that’s the tutorial! In the next post I’ll show you the completed wood walls, which I’m super excited about. They look amazing! That’s a great idea – they really do look like soapstone! 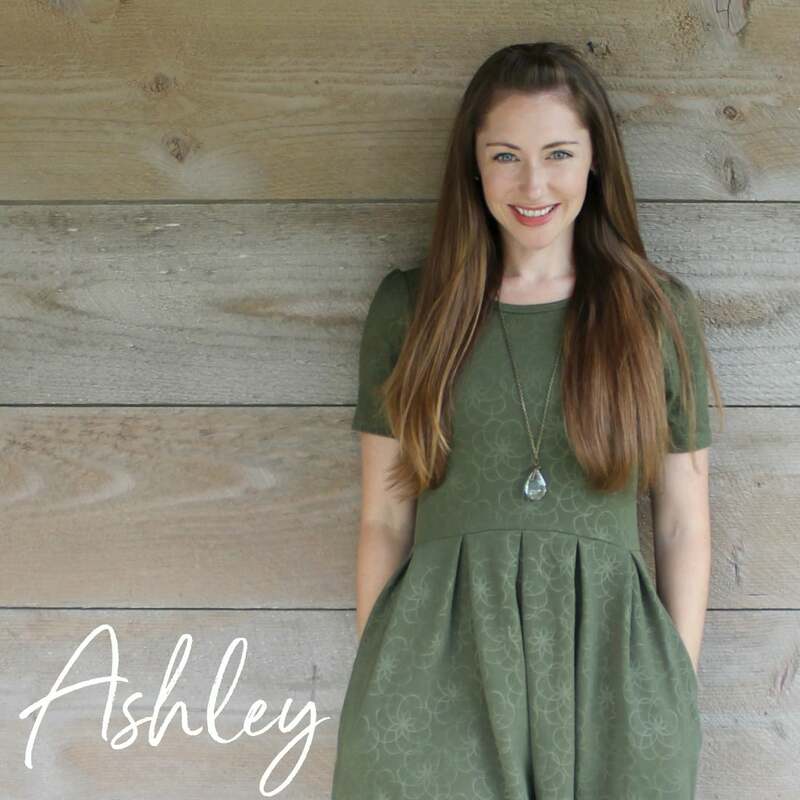 Can’t wait to see the whole project – I’m loving the afters. It’s so amazing what paint can do! It really is… I’m constantly amazed by paint! This remodel (so far) has only cost us about $15. Well…$15, a mattress, and a few months, haha. Wow! 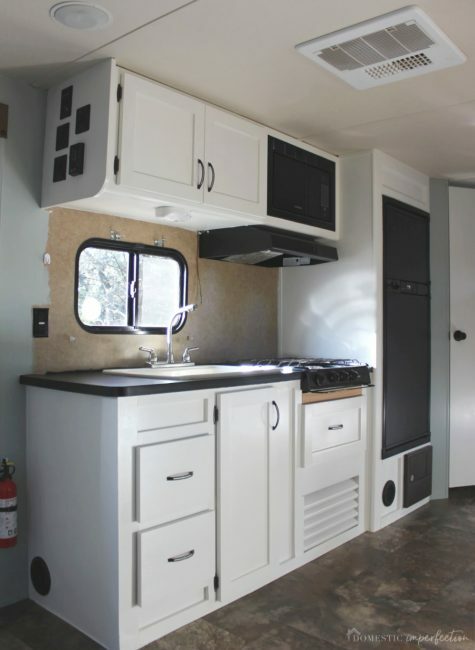 Your camper is going to be so cute when your are done! I have always wanted to paint ours but have chickened out so far. I look forward to seeing yours finished! I’ve painted our kitchen counters twice. I’d say the paint job lasts 2 years before is shows wear noticably (we’re a family of 4 so high use). It is absolutely the fastest and cheapest way to get an instant transformation. 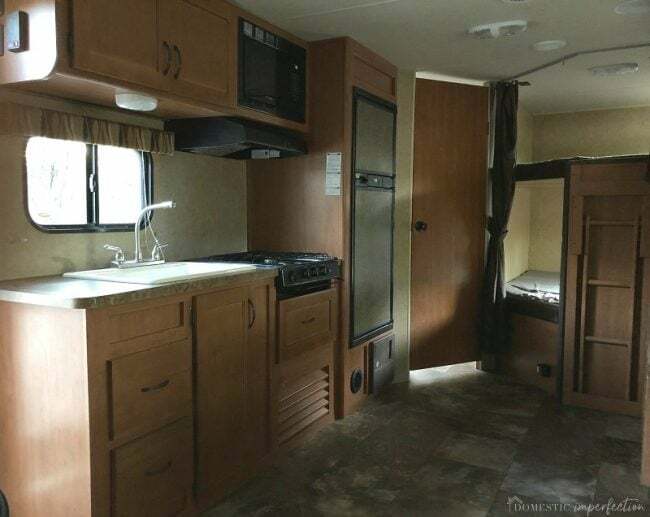 My SIL has soapstone countertops and your paint job looks almost identical to that. You’ll enjoy it so much! Two years is a pretty good run! 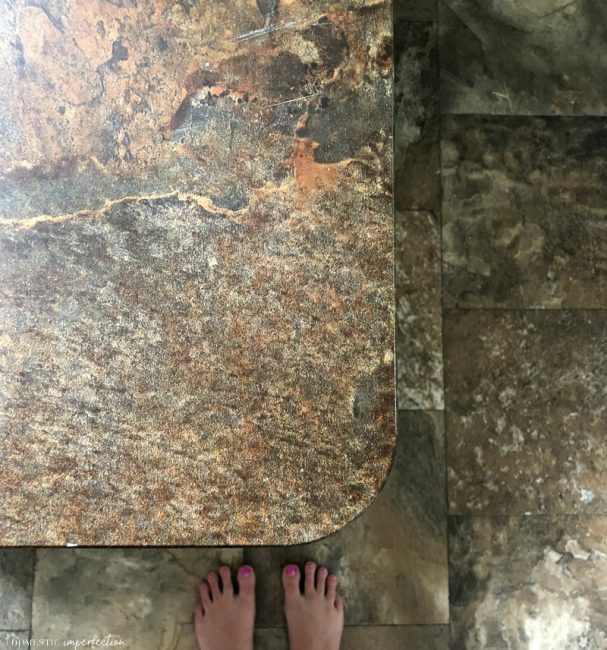 My concrete kitchen countertops are only about two years old and are showing noticeable wear…plus they were way more time consuming and expensive than painted ones. Interesting idea, it looks great and it’s functional, easy to write a quick note down if you had to. I wonder if you could do the same thing with dry erase paint? Maybe a project for a work desk? Anyhow, thanks for posting!